If you have a fireplace or wood burning appliance, you have most likely been told that you need to have your chimney annually cleaned by a certified chimney sweep to remove creosote buildup. Few people stop to explain what creosote is and why it is so important to get rid of. We don’t want to keep you in the dark. We have compiled the most important information that you need to know about creosote. Creosote is the leading cause of chimney fires. It is a smelly corrosive material that is incredibly combustible. It is produced by combustion gases that are given off from burning wood. When the temperature in your flue is below 250 degrees Fahrenheit, these gases condense in your chimney and buildup along the lining of the flue. Since flue temperatures often dip below 250 degrees, creosote regularly builds up. Extreme heat and burning embers that drift up through the chimney can ignite creosote buildup. If there is an extensive amount of creosote, the fire could spread to your home. It is because of the large number of chimney fires sparked by creosote that the National Fire Protection Association (NFPA), a nonprofit organization that has been committed to preventing fires since 1896, recommends annual chimney cleanings. Creosote BuildupCreosote takes different forms, or has different stages, as it builds up. Each subsequent stage is more hazardous and more challenging to remove. Stage 1: In the first stage, creosote is soft and flaky like soot. Stage 1 creosote is easy to remove with a basic chimney brush. Stage 2: Once creosote reaches the second stage it condenses into a hard, shiny flaky substance that clings to flue lining like tar. Though it may look flaky, Stage 2 creosote cannot be brushed away easily. The most effective way to remove stage 2 creosote is with a powerful drill that has metal rods called a rotary loop. 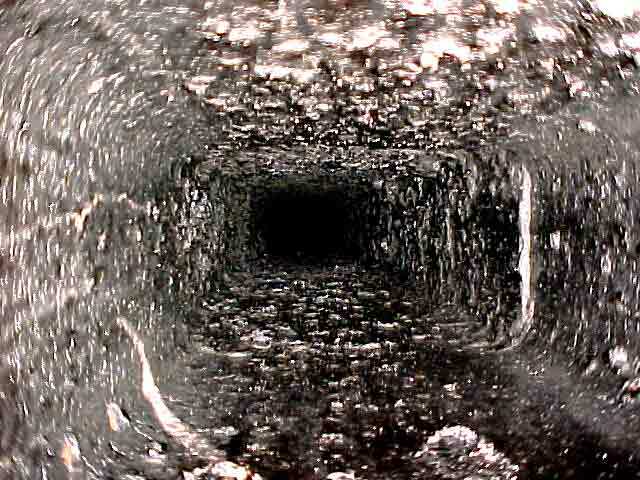 Stage 3: The goal of every chimney sweep is to stop creosote buildup from reaching this stage. Stage 3 creosote is a sticky, highly concentrated fuel. If you looked down a chimney with stage 3 creosote, it would look like tar was dripping down the inside. This tar-like substance hardens along the chimney lining and thickens as more creosote condenses. The thicker and harder it is the more combustible it becomes and the more challenging it is to remove. Chemical removers can be used in some cases to clean up stage 3 creosote. A rotary head with chains can also be effective when it has hardened and is not sticky, but this option is not recommended if you have a clay or ceramic chimney lining since the process can dislodge broken pieces of the lining. In many cases, the best option is to remove the flue lining and replace it. Without proper equipment and training, it is smart to leave creosote removal to professionals. If you have a wood burning fireplace or stove, it is impossible to completely eliminate creosote buildup but there are ways that you can minimize it and prevent it from reaching stage 2 or 3 before your next cleaning. 2. Insure your fire has sufficient air flow. Air is an important ingredient for an efficient fire. If your fireplace has glass doors, it is wise to open them so that your fire can breathe. This will allow your fire to burn hotter which burns a greater amount of the combustion gases. Most modern fireplaces, stoves, and inserts are considered “high efficiency” – so opening a window or using an electric air collar may help. 3. Build hot fires that burn efficiently instead of slow-burning, smoldering fires. How you arrange firewood affects the fire that is created, pack it tightly—with modest gaps in between for airflow—so that it will burn cleaner. Make sure not to close the fireplace doors (ceramic glass) or restrict air flow adjustments too soon before the fire gets hot enough. A good indication that your fire may not be hot enough is if it starts to smolder and look like it might die out. At that point, the glass will also get dirty fairly fast and you are sending excess gases up the chimney. Keep in mind high-efficiency chimneys are smaller than traditional masonry flues or decorative fireplaces so creosote build-up is even more important. New high-efficiency fireplaces also have re-burning features such as secondary air tubes and catalytic combustors that require high-temperatures to operate functionally and cleanly. Keeping cool, smoldering, small fires with wet wood is the surest way to build creosote in high-efficiency fireplaces and clog bird/pest screens. 4. Avoid burning artificial logs. Artificial logs create a large amount of combustion gases that condense into creosote. 5. If you chimney is on the outside of your house, warm the flue before lighting a fire. Cool temperatures in the flue create more creosote. A good way to warm the flue is to make a torch out of rolled up newspaper and hold the lit torch under the open damper until you feel the air warm and feel the draft reserve. 6. Use Creosote Destroyer Powder. Sprinkle a few tablespoons of Creosote Destroyer powder on a medium fire, use this every third fire to help prevent creosote buildup. With the above prevention methods we should be in good shape moving forward, but what about that dark stained glass you’ve got right now? The simplest and most effective method is to use a spray on Liquid Creosote Destroyer. With this kind of cleaner simply spray right onto the creosote and wipe off with a brush or cloth – you will want to wear gloves as it can irritate the skin. Friendly Fires also stocks high temperature glass cleaner. This cleaner helps keep the glass clean (do not use common cleaning liquids on glass). Do you have any other methods you use for keeping creosote under control? If so, please let us know in the comments! Also, be sure to check out our selection of Fireplace Accessories including Tools & Toolsets, Kettles & Steamers, Fans & Blowers, and much more!